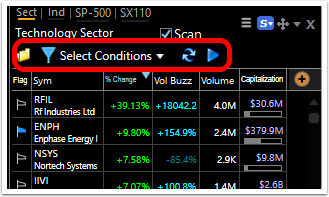 You can filter the integrated Sector/Industry/Stock lists with saved or created Scan conditions. 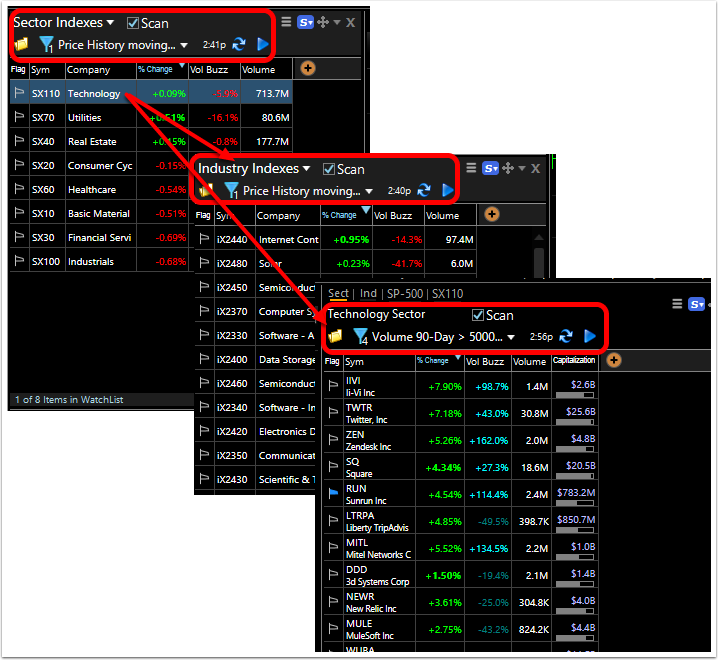 We will use the pre-built Drill Down layout which contains the three integrated WatchLists to show how you can filter Sectors/Industries/Stocks in one layout. 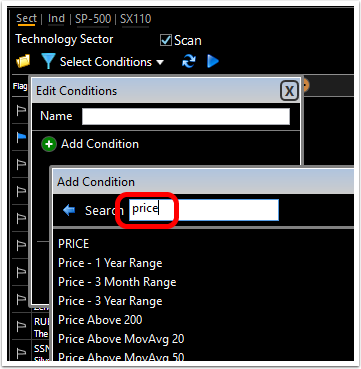 As you spacebar through the filtered Sector list, the integrated Industry and Stock lists can be automatically filtered as well. 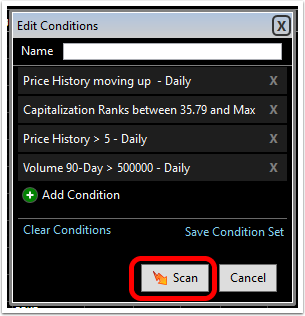 Steps to set up the Scans are below. 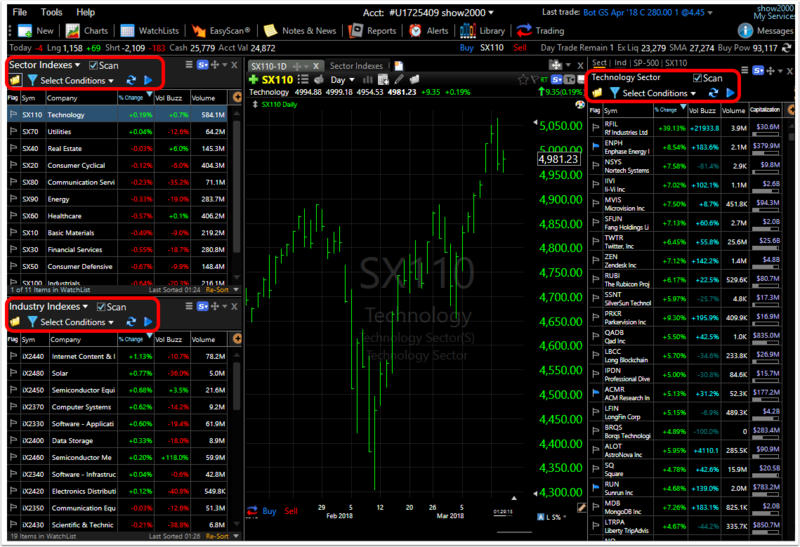 For more information on the Drill Down pre-built layout, click here. 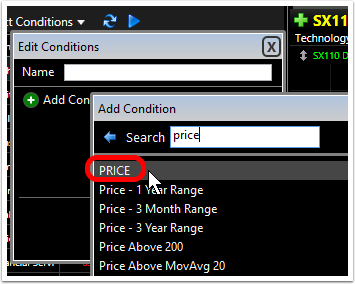 To review all the pre-built layouts, click here. Place a checkmark next the the Scan field in the Sector WatchList. 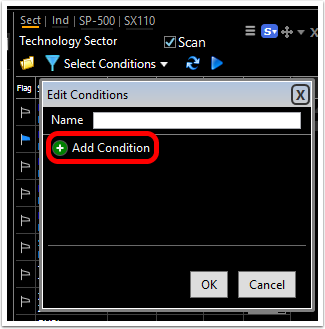 This opens the Scan tools with which you can select saved conditions/condition sets or create a new condition/condition set. 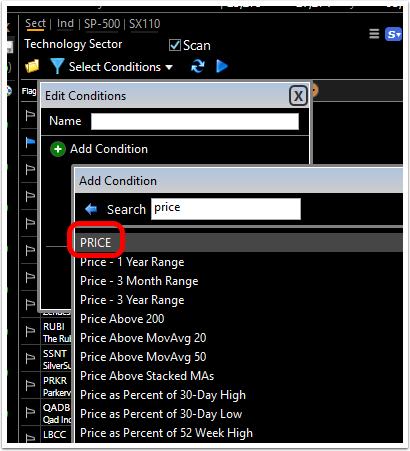 In the condition Editor, click Add Condition. 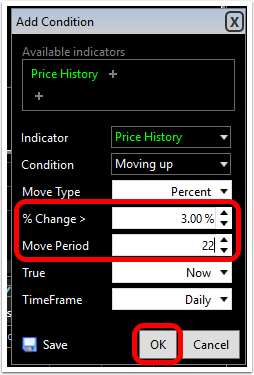 Use the typing shortcut in the Search field to select a criteria to work with (our example will be Price up at least %3 in the last 22 days). 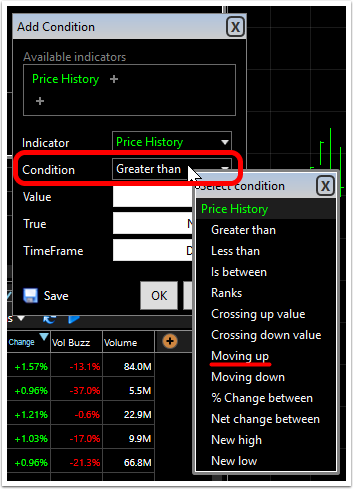 Select criteria from the list. 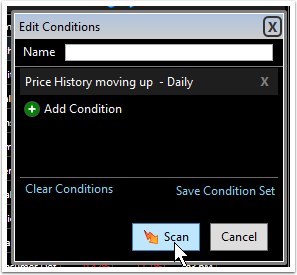 With the condition created, click Scan in the Editor. 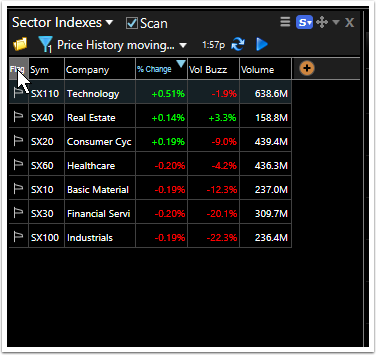 This filters the Sector list so that only Sectors with at least a 3% move in the last trading month appear in the WatchList. 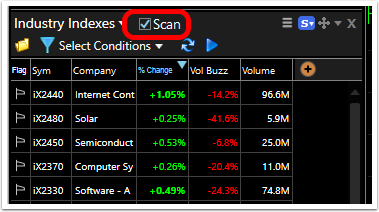 Place a checkmark next the the Scan field in the Industry WatchList. 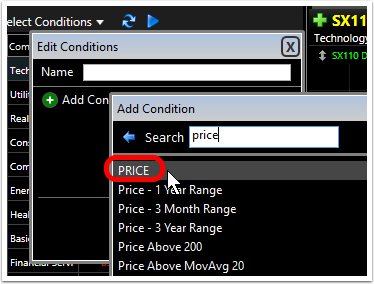 Use the typing shortcut in the Search field to select a criteria to work with (our example will be Price up at least 3% in the last 22 days). 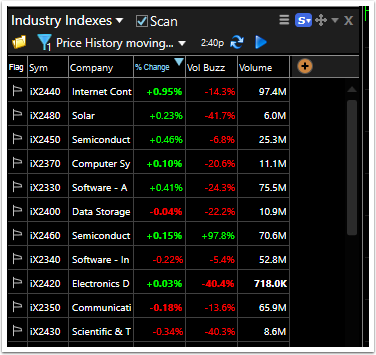 This filters the Industry list so that only Industries with at least a 3% move in the last trading month appear in the WatchList. 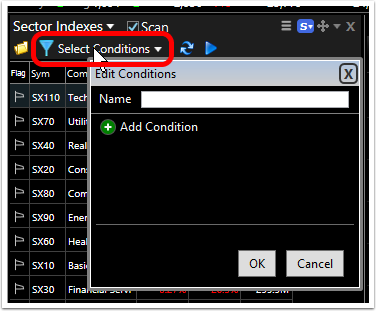 Select a Sector from the filtered (scanned) Sector List. 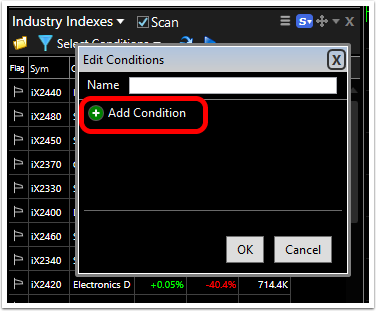 This will automatically load the correct Industries for that Sectors in the Industry WatchList but they will also be filtered (scanned) by the condition. 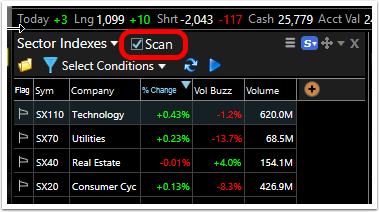 Place a checkmark next the the Scan field in the Stock WatchList. 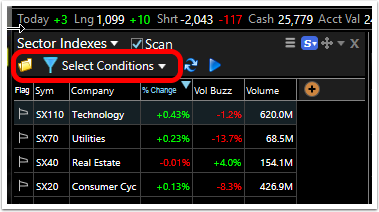 Add other conditions that may be important to you using the steps above. 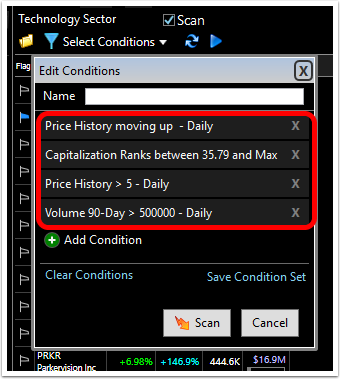 An example here is adding: Market Cap in the top 60% of the market, Price greater than $5 and 90-Day Volume greater than 500,000 shares. 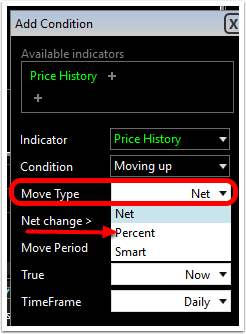 This filters the Stocks list so that only stocks with at least a 3% move in price in the last trading month, trading over $5/share, mid- to large-cap that normally trade at least half a million shares per day appear in the WatchList. 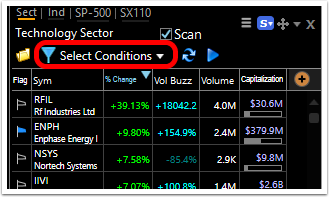 Select a Sector from the filtered (scanned) Sector List. 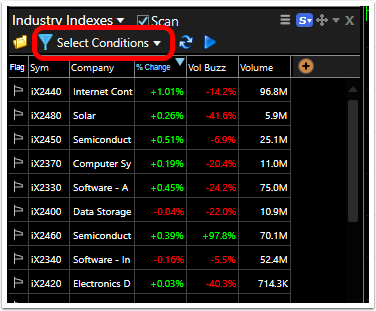 This will automatically load the correct Industries for that Sectors in the Industry WatchList but they will also be filtered by the condition. 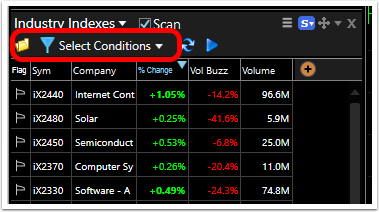 It will also automatically generate the WatchList of stocks that make up the Sector but they are filtered by the multiple conditions defined above. 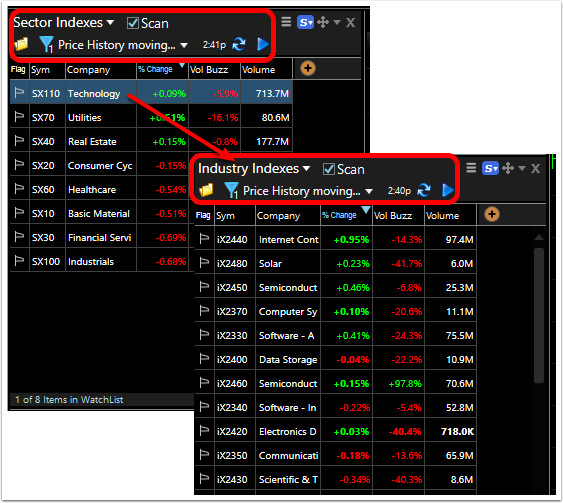 Select a Sector from the filtered (scanned) Sector List. 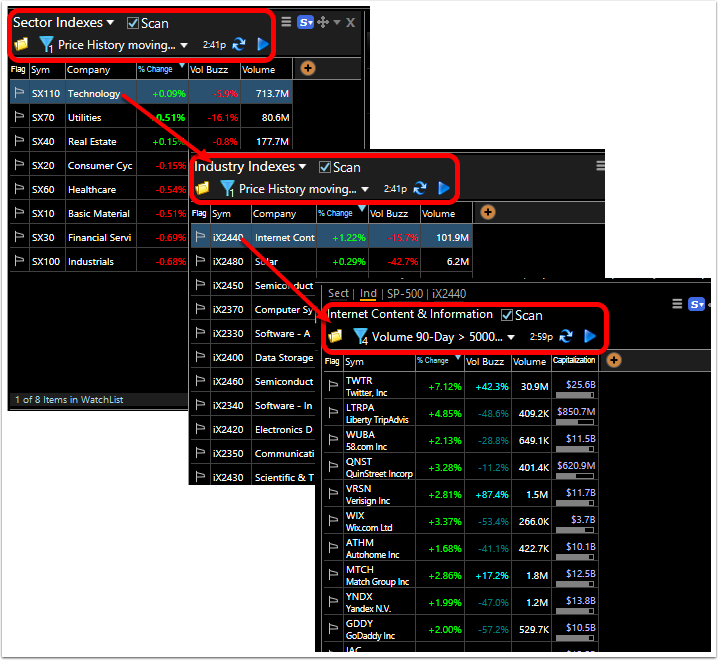 This will automatically load the correct Industries for that Sectors in the Industry WatchList but they will also be filtered by the condition. 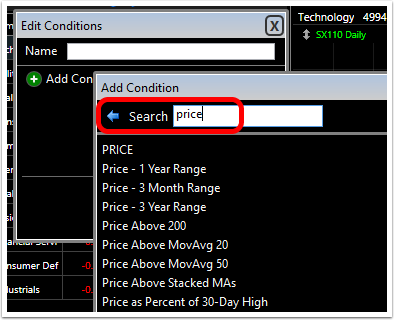 Click on an Industry in the list and it will automatically generate the WatchList of stocks that make up the Industry but they are filtered by the multiple conditions defined above.